Kelly Florio Kasouf, June Ambrose, Tracy Anderson, Lisa Salzer, and Simon Doonan celebrated the launch of The Super Adventures of Sophie and The City: Grand Central Escapades, a children’s book by Kelly Florio Kasouf, along with the debut of her jewelry collaboration with Lulu Frost on November 29th at Barneys New York Madison Avenue. The fabulous soirée included fun activities; complete with a dress up station for the children! The Super Adventures of Sophie and The City: Grand Central Escapades, is the second book in The Super Adventures of Sophie and The City series. Sophie is back with another fantastical adventure in New York City! On her very first trip to Grand Central Station, Sophie meets Henry, a charming paperboy who takes her on a magical train ride back in time that she will never forget. Come along and explore the Roaring Twenties with these two new best friends as they journey through the past meeting iconic historical figures along the way. From flappers to jazz musicians to fashion designers, Sophie learns what life was really like during this era - but it is her trip to Ellis Island that teaches her the true meaning of family and courage. 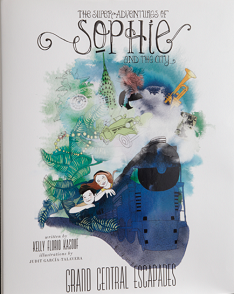 With publishing in her bones, Kelly Florio Kasouf adds a second title to the Super Adventures of Sophie and the City series with Grand Central Escapades. After growing up inside the walls of Conde Nast Publications, Kasouf now expands the scope of her storytelling across time with a tale chock full of history, architecture, culture, and of course, fashion. Embraced by the design community, the Super Adventures of Sophie and the City has been featured in InStyle, Glamour, New York Magazine, The New York Times and many more. The Super Adventures of Sophie And The City: Grand Central Escapades offers a whimsical captivating storyline that is rich with NYC history and gorgeous illustrations; this storybook is PERFECT for gifting this Holiday season!